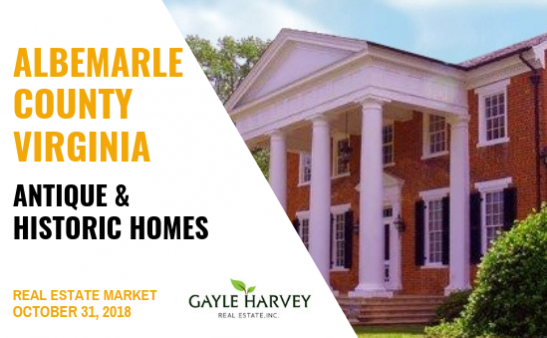 Charlottesville Historic & Old Homes for Sale – by Gayle Harvey Real Estate, Inc.
Latest real estate market information for antique and historic homes in South Central Virginia – Buckingham and Nelson Counties. 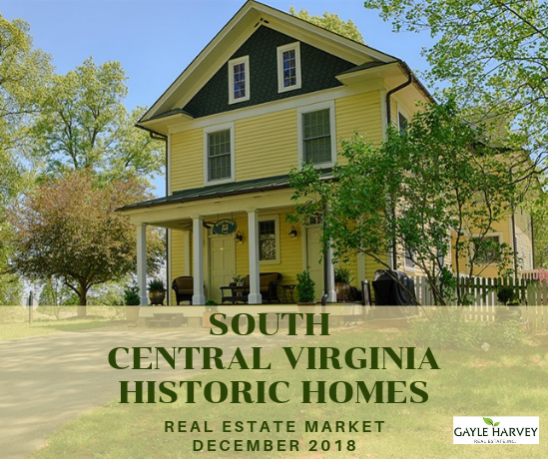 There are just a few Antique Home listings in the Southern part of Central Virginia. All of the historic homes in this area are priced between $300K to $1 million. There have been a total of just three sales in the past year, with one pending sale at year end. Two of the sales were for historic home listings on parcels of land over 21 acres in size. The pending sale was also for a property with more than 21 acres of land. One sale was for a listing with 5-21 acres of land attached. 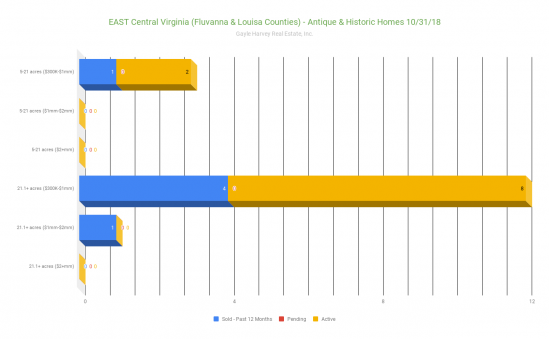 There are currently four active listings for antique homes in the southern part of Central Virgina. Three of these listings are on 21+ acres, with the final listing being on a smaller parcel between 5 and 21 acres. All of the active listings are priced between $300,000 and $1 million. 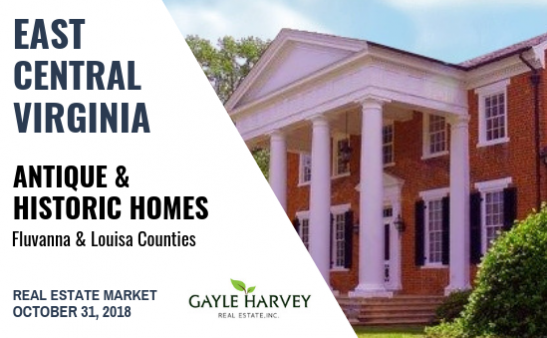 Latest real estate market information for antique and historic homes in East Central Virginia – Fluvanna and Louisa Counties. Antique homes in Central Virginia’s Eastern counties are, for the most part, priced in the $300K to $1 million range. The majority of the sales in the past year and the current active listings are in that price range for historic homes with land parcels over 21 acres. There has been just one sale in past year in the $1 million to $2 million range, and there is currently one active listing over $2 million. Both of these listings are for historic homes on land parcels over 21 acres. For buyers of antique homes in these areas, it is less common to see historic home listings on smaller land parcels. Overall, there are currently six active listings and a total of four sales in the last year, with no pending sales at year end. The Antique & Historic Homes market is unique, and it’s important for buyers and sellers to have an experienced and knowledgeable real estate broker who understands the specifics of the market and the transaction. 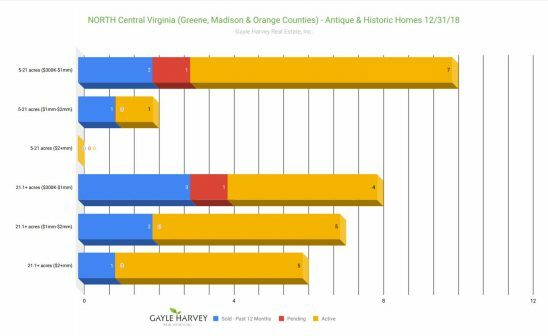 Latest real estate market information for antique and historic homes in North Central Virginia – Greene, Madison, and Orange Counties. 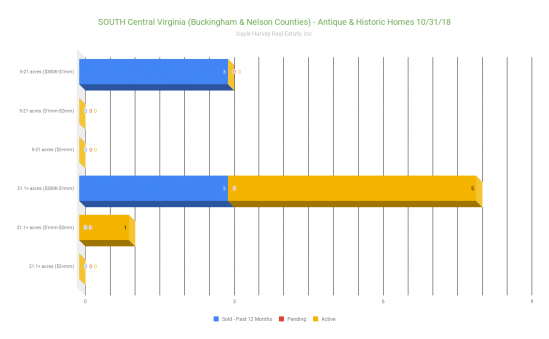 Central Virginia is the ideal place to search for that perfect antique home. It’s a buyers market right now in the northern counties of Central Virginia. There are a total of 22 active listings right now. With a mere nine sales total in the past 12 months and one pending sale at year end, the market is slow for sellers. Many of the active listings for historic homes in the northern areas of Central Virgina are on land parcels over 21 acres with a near even distribution among price points ranging from $300,000 to over $2 million. Antique homes in these counties that are on smaller pieces of land (5-21 acres) are mostly listed at prices between $300,000 to $1 million, with just one active listing priced between $1-2 million. As a buyer or seller, it’s important to have a real estate professional who has experience with antique properties and the special circumstances that might come up. Each historic home has it’s own unique features and considerations. Latest real estate market information for antique and historic homes in Albemarle County, Virginia. Antique homes in Albemarle County priced under $1 million appear to be in high demand right now. In the past 12 months, a total of 20 listings have sold in this price range, with only two available active listings at year end. This could be a good time for historic homeowners who have been considering selling to take advantage of the low inventory and get their property listed. Albemarle historic properties over $1 million in price are seeing far fewer sales. With only a total of ten sales in the past 12 months, one pending sale, and 22 active listings, historic homes in this price range could be sitting on the market for a while. With such different situations for both buyers and sellers of historic homes here in Central Virginia, it is important to have a good real estate broker to help guide you through your purchase or sale. 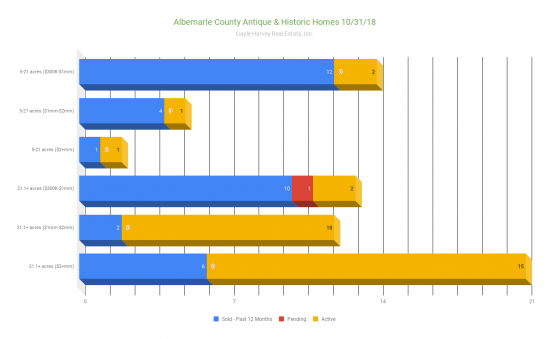 If you are interested in reviewing current market information for antique and historic homes in all of Central Virginia, you can find that HERE. 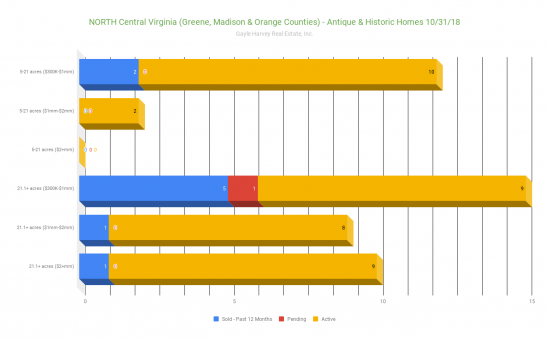 Latest real estate market information for antique and historic homes in Central Virginia. There are an abundance of active listings right now for pre-1940’s homes. Buyers can have their pick from a wide range of beautiful antique homes. Historic homes that range in price from $300,000 to $1 million have the highest number of active listings and the most sales in the past 12 months. Of the homes in this price range, the antique and historic homes on parcels over 21 acres have had a few more sales in the past year than homes on less than 21 acres. There are thirty-three active listings for historic homes on over 21 acres of land at a price point of $1 million and over. Unfortunately, there have only been a total of 10 sales in the past year for historic homes of this size at this price level. Sellers could be facing a very long time with their Central Virginia antique homes on the market. With the current market, it’s important to have a real estate broker who is knowledgeable and experienced with historic homes. 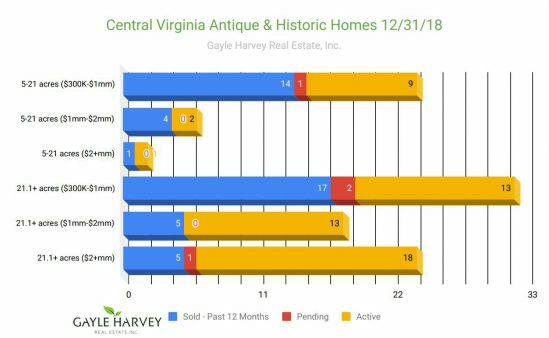 If you would like to discuss any of the information presented here, or have questions about buying or selling an antique home in Central Virginia, please contact me, Gayle Harvey, at Gayle@GayleHarveyRealEstate.com or 434-220-0256. Check back each week as we break down the active listings and past sales by the different geographical areas in Central Virginia. 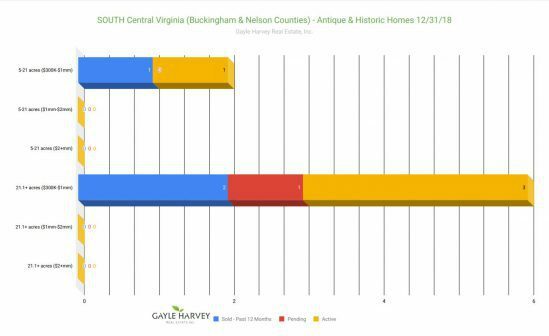 Latest real estate market information for antique and historic homes in Buckingham and Nelson Counties of Central Virginia. There are just a handful of Historic Home listings in the Southern part of Central Virginia. The majority of the antique homes in this area are priced between $300K to $1 million. There have been a total of six sales in the past year, with three being for historic home listings on 5-21 acres, and three listings with antique homes on larger parcels of land, over 21 acres. There are currently six active listings, all of them on 21+ acres. One of these listings comes in at the $1 million to $2 million price range, with the remaining five coming in with a list price between $300k and $1 million. 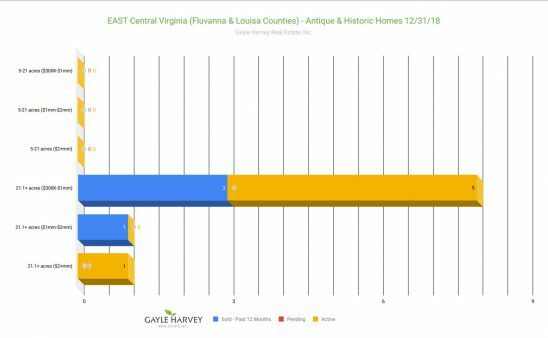 Latest real estate market information for antique and historic homes in Fluvanna and Louisa Counties of Central Virginia. Historic Homes in the Eastern parts of Central Virginia are mostly priced in the $300K to $1 million bracket. There have been the most sales in the past year and the most active listings in that price range for historic homes with land parcels over 21 acres. With just two active listings and one prior sale in the past year for historic homes on 5-21 acres, these listings are less common. For buyers of antique homes in these areas, it is rare to see anything priced over $1 million, with only one property selling above that level in the last 12 months. Overall, there are currently 10 active listings and only a total of 6 sales in the last year, which could mean sellers can expect their listings to be on the market for quite some time before a sale. 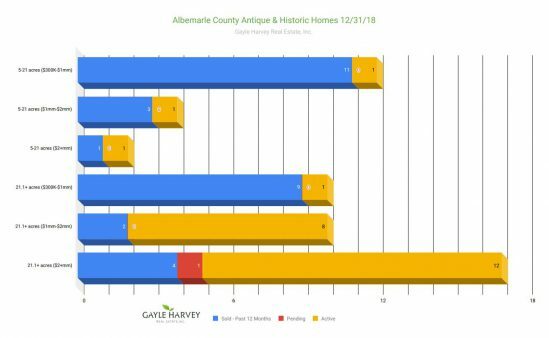 It’s good news for buyers looking for the perfect antique home in the northern counties of Central Virginia. There are a total of 38 active listings right now. With a mere nine sales total in the past 12 months, the market is slow for sellers. The majority of historic homes with active listings are on land parcels over 21 acres with an even distribution among price points ranging from $300,000 to over $2 million. Antique homes in this area on smaller pieces of land (5-21 acres) are mostly listed at prices between $300,000 to $1 million, with just a few priced between $1-2 million. Each historic home has it’s own unique features and considerations. As a buyer or seller, it’s important to have a real estate professional who has experience with antique properties and the special circumstances that might come up. Not often can you find a historic home for sale along the James River in Virginia. Swan Hill on 54+/- acres offers splendid riverfront living in a circa 1731 home. The welcoming tree-lined driveway lets you know that you are entering a special property. The driveway circles around the front of the home. At the rear of the home you will find expansive porches on both levels of the home to enjoy the scenic vistas towards the James River. Adjacent to the home is the guest cottage which is also an old home. Front and rear doors in the foyer allowed for nice breezes through the home. Today the home has modern A/C systems. While yesteryear charm exudes throughout this beautiful home, modern conveniences have been added such as a wonderful chef’s kitchen. All the rooms are large with high ceilings. Friends and family will love visiting! The farm has a large Morton building with two stalls and kennels. The barn has hot & cold water and its own septic. It is perfect for nearly every type of livestock with additional room for a workshop too! And the best part of the farm is the James River which offers many recreational opportunities as well as a great place to just relax. For more details about the fabulous Central Virginia historic home and farm on the James River, click here or call Gayle at 434-220-0256. This Virginia Historic Farm for Sale is offered at $880,000. Antique and historic homes in Albemarle County priced under $1 million appear to be in demand. In the past 12 months, a total of 35 listings have sold in this price range, with only six active listings right now. This could be a good time for historic homeowners who have been considering selling to go ahead and get their property listed. For properties over $1 million in price, the real estate market is quite different. With only eight sales in the past 12 months, and 25 active listings, historic homes in this price range could be looking at a lot of competition for few buyers. 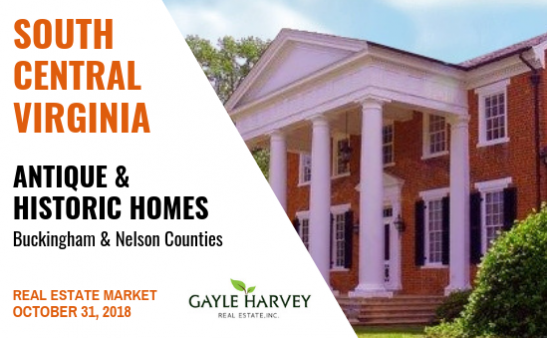 With such a unique situation for both buyers and sellers of historic homes here in Central Virginia, it will be important to have a good understanding of the current market conditions, a strong strategy for your transaction, and a competent broker who is experienced in buying and selling antique homes. Charlottesville Historic & Old Homes for Sale Copyright © 2019.